RKO Radio Pictures | "DESTROY ALL FANBOYS!" You’ll Find Out: Yet Another Oddball Film I Need to See! Ha. I’d never heard of this 1940 comedy until about a month ago when someone asked me if I’d seen it. I hadn’t, noted to myself to look it up and forgot about it thanks to the stupid time I’ve been having on a few fronts keeping me from being very much entertained. Anyway, in my inbox this afternoon was the trailer above and I got pulled right into wanting to know more. What a cast! 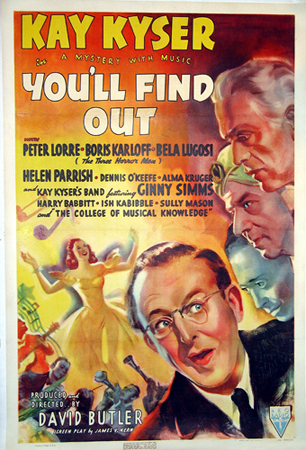 Boris Karloff, Béla Lugosi, Peter Lorre… and Kay Kyser & his band? Yeah, I laughed a lot at the casting here. And if I’m not mistaken, the band and bandleader are the heroes here. Oh, this one’s going on the “gotta watch it!” list for sure. Well, I’m gathering I’ll need to haunt TCM and see when it turns up again. It’s usually the case when I hear about an oldie like this they have in their library that it runs less than a week or so later. Mood lightened considerably? You betcha. I happened to be flipping around the dial randomly again and TCM paid off, as usual with a film I hadn’t seen yet (but had heard of). This clip from director Dorothy Arzner’s 1940 film Dance, Girl, Dance of Lucille Ball doing the number “Jitterbug Bite” cracked me up because in another universe, she’d have been more famous for her sassy song and dance numbers and not trying to “splain” every week to Ricky about why the oven grew a twenty-foot bread loaf, why she stuffed too many chocolates into her face at the chocolate factory or got into a catfight in a vat of wine grapes with some stubborn grape-stompers. Imagine this as a movie idea today: Snow White and the Seven Dwarfs with Snow being an extremely talented exotic dancer type and those dwarfs a bunch of stuffy but eager to learn elderly eggheads she ends up hanging out with to teach them all the things they didn’t know. Once you get your eyeballs above the obvious jiggle-tease material and plentiful opportunities for modern day humor sixteen writers working together come up with, the results would probably be pretty darn terrible. I can see the trailer now: two minutes, thirty eight or so of slow-mo cleavage shots and some special guest cameo coot rattling off one-liners, plus someone getting hit in the nether regions with a golf, basket or other ball, maybe a nice pratfall, a fart joke, a fat girl joke and some annoying music on that soundtrack that doesn’t even fit. Yeah, that’s not a movie I’d want to see at all. 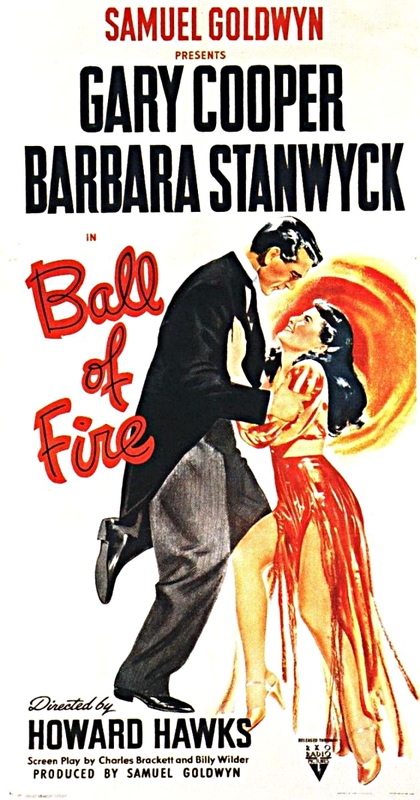 Fortunately, Howard Hawks’ 1941 film Ball of Fire takes the Snow White and thanks to a wonderfully funny and sassy Barbara Stanwyck helping loosen up those old guys (and an even stuffier Gary Cooper), a great script and plenty of screwball humor, it still holds up today as a total riot. With Ernest B. Schoedsack’s 1949 film Mighty Joe Young, stop motion animation fans saw the torch passed from the past master of the technique, Willis O’Brien to his willing, eager and more than able apprentice (and future master), Ray Harryhausen. Where 1925’s startling The Lost World and 1933’s epic King Kong helped pioneer stop motion (and its more comedic sequel, Son of Kong added a neat dinosaur chase scene to the list of O’Brien’s classic scenes), Mighty Joe Young was pretty much Harryhausen’s film from start to finish.